Inventory We are a resale marketplace, not a box office or venue. Ticket prices may exceed face value. This site is not owned by Kings Theatre . 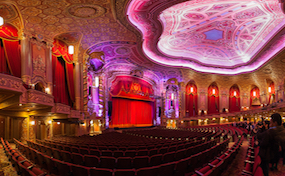 The Kings Theatre Brooklyn opened back in 1929 and operated as a movie theater until 1977. At that time it closed until it reopened in 2010 fully renovated. The Kings Theatre box office is located at 1027 Flatbush Ave in Brooklyn, New York. The theater known for most of its existence as the Loew\’s Kings Theatre has a seating capacity of 3,000. The venue now plays host to a variety of concerts, comedy acts, and smaller family productions. Kings.TheaterBrooklyn.com is not owned or operated by any official website, box office, venue, and or supplier. We are an online retailer in the resale secondary marketplace. Tickets on our sites tend to be above face value and will change quickly with demand. To order tickets to all Kings Theater Brooklyn events please follow the steps online through the checkout or call our friendly staff at your earliest convenience.